This is a good way of seeing both Aragonese sanctuaries of the Marian Route in an easy and comfortable trip. 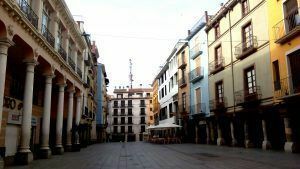 Not far from Zaragoza you will find Huesca. It is a very hospitable Town. It is worth taking a look at the historic quarter. The cathedral and the San Pedro el Viejo church are almost mandatory stops. The Church of San Pedro el Viejo, declared as National Monument in 1885, is a simple and beautiful example of Romanesque architecture of Aragon and one of the jewels of the monumental heritage of the city. Its cloister, one of the most beautiful. 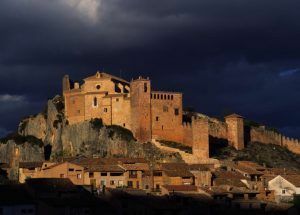 Its Royal Pantheon, the place where the remains of the kings Alfonso I “the Warrior” and Ramiro II “the Monk” are kept. The Cathedral is a magnificent gothic temple. On the outside you can appreciate a splendid decoration. The High Altar is the wonderful piece of Damian Forment, it represents the Passion of Christ. Next to the Cathedral is the Diocesan Museum, which offers genuine wonders of sacred art in its various rooms of jewelry of medieval, renaissance and baroque art. In front of the cathedral stands the Town Hall, a fine example of civil architecture of Aragonese Renaissance. 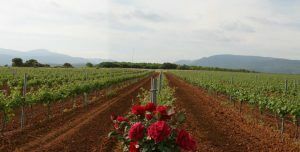 From Huesca we move towards and into the ‘Sierra y Cañones de Guara Natural Park’ and the Somontano Region, land of great wines. 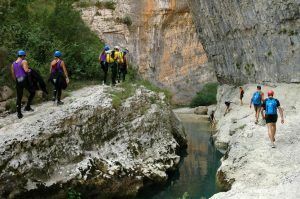 The Cañones and Sierra de Guara Natural Park is a place that has the most spectacular ravines and canyons in Europe. These geological formations have become the leading destination in water adventure sports. 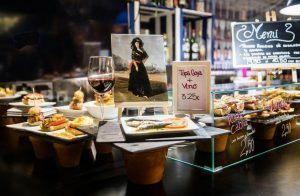 In regards to the cultural part, the impressive village of Alquezar is located between deep ravines of the Guara Mountain Chain (Sierra de Guara) and the River Vero. It offers a medieval urban area declared Historic and Artistic Site from which the Colegiata-Castle of Santa María la Mayor stands out. Barbastro, capital city of the Somontano shire, has a magnificent cathedral and an excellent Diocesan Museum. We went through the capital of the Somontano Barbastro, situated on the banks of the river Vero. It is the birthplace of St Josemaria Escriva de Balaguer, founder of Opus Dei (now you can make a guided visit where the visitor knows the places of the city more relevant in the life of St. Josemaría). The city has important monuments such as the magnificent Cathedral of the Assumption of the 16th century. The building was constructed with the purpose of g for getting back the category of Episcopal see for the town. Of Gothic appearance and design, inside is Renaissance style. It stands out for its large size and for its spectacular vaults. The Cathedral of Barbastro is set at the level of the best churches. Next to the Cathedral is the Episcopal Palace which houses the new Diocesan Museum. The sanctuary was open to public in 1975. It has become the main center of devotion for people living in the Aragonese Valleys of the Pyrenees. Approaching Ordesa and Monte Perdido National Park from Torreciudad is as easy as following the road to Ainsa and then to Torla (main entrance of the park). This park is a UNESCO World Heritage. From Torreciudad you can also go to Lourdes. This is another one of the stages of the Marian Route.